Recently, I’ve come to the realization that my view of Europe might be a little skewed. Over this past weekend, I was lucky enough to go to Budapest with some of my friends. As soon as we dropped our things off at the hostel and started to walk around, my observation was, “wow, this place kind of looks like Italy”. Immediately after I voiced my opinions, my friends gave me strange looks. Elise and Casey told me that to them, the heart of Budapest looked a lot more like Paris than it did Italy. Prior to arriving in Budapest, the only representation of Europe I had was Italy. I had just assumed that every part of the EU was going to be drastically different, none of it looking like one another. In a way, the expectations that I had in my head were not met the instant I stepped off of the plane. (Looking back on it, I now realize that those were very naive expectations, especially considering that the countries here are way smaller than the states in America). After walking around and visiting all of the places suggested to us on travel guides, I realized the beauty laying inside of the city. Of course, it was different compared to Italy. There were different people, structures, culture, and a completely different history. I shortly realized how important their history is to them, and rightly so. ANOTHER (do you see a common theme here?) 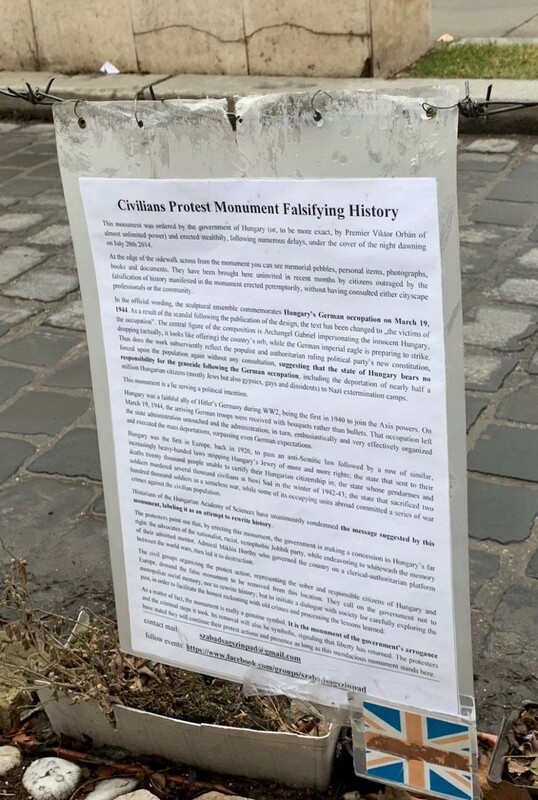 thing that I had not known about Budapest was the effect that World War II had on the citizens. Over 600,000 Hungarians died during the Holocaust, only to subject the country to communist rule shortly after. We visited the House of Terror which explained everything about these victims. I found it interesting to discover that the building of this museum had previously held offices of multiple of the detrimental leaders from the 20th century. It also used to be a party hub for the Nazis. The museum was a great tribute to those who had lost their lives, ensuring that their tragic history would be told, revealing the evils of these dictators. However, the stories of the devastations from WWII did not stop once we stepped outside of the House of Terror. It was very evident that the memories of the wrongly executed still lingered in the streets. 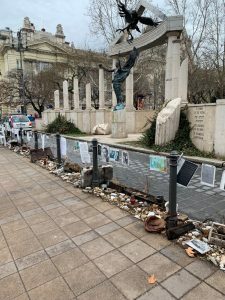 It was on our walk back from seeing our planned touristy spots- the palace on the Pest side, the Hungarian Parliament building, and the Shoes on the Danube, that we came across something completely unexpected. It was a memorial. This was not a memorial that was on any website. It was not a memorial that had been suggested for us to see. 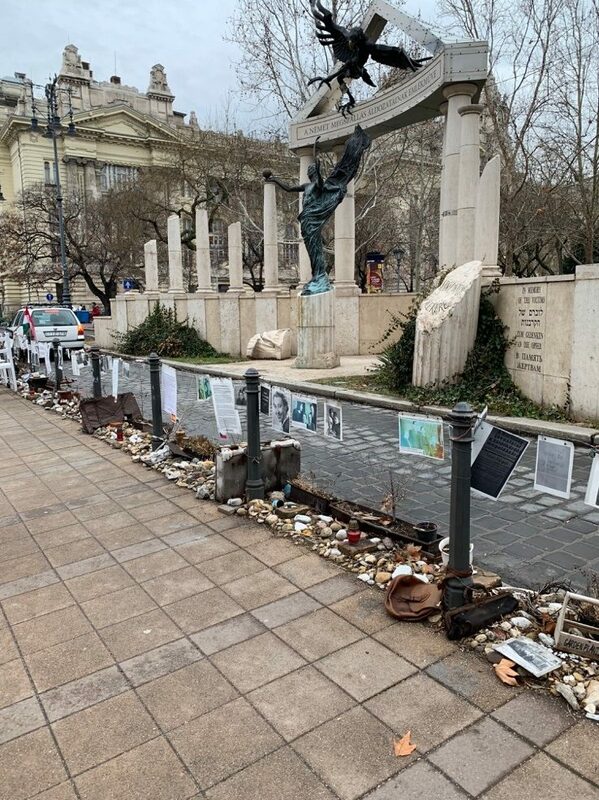 It was just a memorial that the Hungarians arranged. 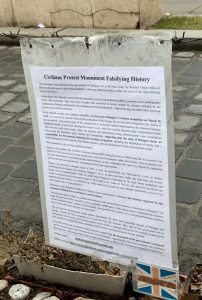 More specifically, it was a protest to a statue that was built in memorial of those murdered during World War II. I’ve included pictures of the explanation of the protest as well as the artwork itself. But, in summary, there is Archangel Gabriel holding a sphere in his hand. Above him, there is an eagle swooping down to grab the sphere. The government intended for Gabriel to represent Hungary unwillingly letting Germany (the eagle) take over the country (the sphere) in 1944. Across from the statue, there are belongings of loved ones who were brutally murdered. 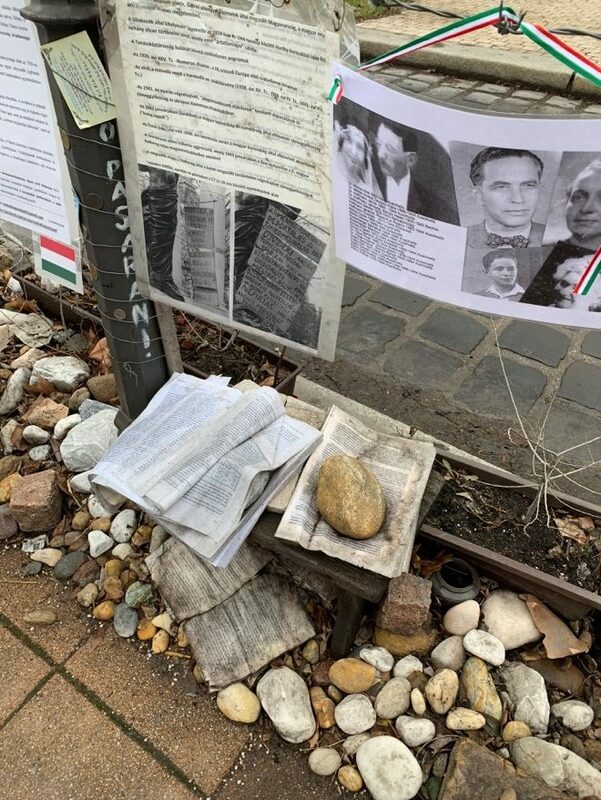 There are multiple pictures, shoes, letters, books, bags and other keepsakes that are set up in order to remind anyone who passes by of the executions. The family members are protesting to try to have the government admit their wrongs from decades ago by taking down the misleading monument. As I read the stories at the protest, I came to a gut-wrenching realization. After learning about WWII for a majority of my life (and thinking that I had a grasp on the overall catastrophes), I had never known the impact that it had on Hungary. Yet, this community makes sure that they still live with memories of the losses every day. They have reminders as a part of their walk to work, a friend’s house, school, or even the grocery store. I believe that these protests, museums, and monuments represent the members of this city. It shows how they will unify to continue to fight for the integrity of their loved ones. I think that this protest could have been easy to walk past on a day to day basis, or even as a tourist. However, they decided to put it up anyway. They will never forget the government’s abandonment of their people, and they will never surrender until they have adequate justice. There is so much uniqueness that is scattered throughout that city, and I will always have those memories with me. Budapest no longer looks like Italy to me, and I will never again visit somewhere with the expectation of a whole new world. In the past, I have been extremely disappointed during times when the visions that I had in my head did not match what I first experienced. However, I have recognized that most times, reality can be better than what I have conjured up myself. With that said, I can genuinely say that Budapest exceeded my expectations. (And I hope you can tell that it was for more reasons than the beautiful architecture and landscapes.) Although, here is a big lesson that was reinforced during this trip for me: it is not meeting your expectations that make an experience rememberable for a lifetime, it is the discoveries along the way.